Remove the seeds, strings and skin of the squash. Cut the flesh in small pieces. Cook the squash pieces for 5 minutes with the butter on a low fire, covered with a lid. Pour 20 cl of water, add a tea spoon of coarse salt, cover and cook for 20 minutes on a low fire. Mix the squash in the vegetable mill or food processor with a fine grid. Add the liquid cream and season with salt and pepper. Bring slowly to the boil. 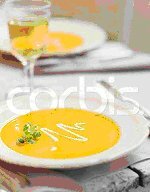 Pour the squash soup in each warm plate and place 5 slices of fourme d’Ambert on the top. Wait for a few moments until the cheese has melted, before enjoying. Rinse the basil leaves. Dry them in a kitchen towel. Slice them thinly with a knife. Rinse and dry the peppers. Remove the peduncle. Cut them in half. Remove the seeds and the white strings. Cut them in dices. Rinse and dry the courgette. Cut it in small slices and re-cut them in 4. Place them in a frying pan with the dices of pepper, the thinly sliced basil leaves and the Provence herbs. Pour a table spoon of olive oil. Season with salt and pepper. Cover and cook for 20 minutes on a low fire. Break the eggs in a salad bowl. Add the sliced parsley and 2 table spoons of water, salt and pepper. Beat the eggs. Heat 2 table spoons of olive oil in a non-sticky pan. Pour the eggs. When they become creamy, spread the vegetables in the middle. Fold the omelette in 3 and leave it to brown. Slip it onto the serving dish and serve immediately, with a mixed salad and small black olives. Quickly wash and rinse the mushrooms, cut them in small pieces, then sear them for a few minutes in a pan with the hot walnut oil. Drain and chop them. Pre-heat the oven at 200C (th 6-7). Mix the sausage meat, mushrooms, chervil, salt and pepper. Remove the string from the joint, delicately open it, then spread the stuffing inside. Close the joint again, tie it up well. Put the joint in a dish with the vegetable oil, a knob of butter, the onion and carrot cut in pieces. Season with salt and pepper. Roast for about 1h15, regularly turning and basting the joint. Pour the veal stock in the dish 20 minutes before the end of the cooking time. Take the joint out of the oven, wrap it in foil and leave it for 15 minutes. Allow the cooking juice to reduce, filter it, add a knob of butter. Remove the string from the joint, cut it and serve it with a whole pan of ceps, St George’s mushrooms, chanterelles and chestnuts browned in butter. Heat the oven at 240C (th 8), grease the dish with butter. Peal and wash the apples, cut them in pieces, brown them in a pan with a little butter for 5 minutes. Peal and wash the pears, cut them in pieces and add them to the apples. Cook for 3 minutes stiring once in a while. Put the fruit in the dish and pour the lemon juice on top. Mix the flour, sugar, ground almond and cinnamon, add the soft butter cut in pieces. Blend all the ingredients with your fingers in order to get a coarse short-crust pastry. Spread a regular layer of the combination on the fruit. Put in the oven and cook for 20 to 25 minutes. Serve slightly warm with a fouetté cream or some ice cream.